Acer has launched a new high-end ultrawide monitor that caters to those who prefer high refresh rates above everything else. The Predator Z301CT is a 30-inch display with an 1800R curve and a modest resolution of 2560 x 1080, but the star of the show here is a refresh rate that can go as high as 200 Hz with 4ms response times. To achieve such a high refresh rate, Acer has used VA LCD technology, so you won't be getting the same qualities as a top-end IPS LCD. However, this panel does have rated contrast of 3,000:1 and 178/178-degree viewing angles, plus it supports 16.7 million (8-bit) colors and 100% sRGB coverage. Brightness is rated at 300 nits. 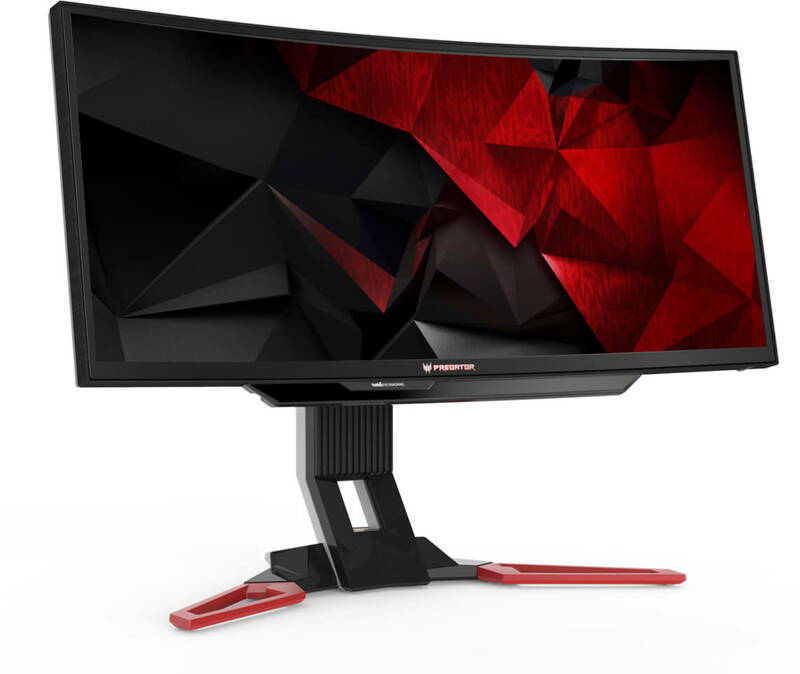 As this is monitor is branded 'Predator', there are a number of gamer-friendly features, including Tobii eye tracking and G-Sync. Eye tracking is a particularly interesting feature that seems to be increasing in popularity, especially in some high-end gaming laptops, and the number of games that support the technology is increasing at a reasonable pace. The Z301CT comes with HDMI 1.4 and DisplayPort 1.2a inputs as well as a USB 3.0 hub. The stand supports both height, swivel and tilt adjustments. Interested gamers will be able to purchase this display in February for $899. Alongside the Z301CT, Acer has bolstered their Predator line with the XB252Q and XB272, 24.5- and 27-inch variants of a 1080p TN LCD with a maximum refresh of 240 Hz. Both panels support Nvidia's G-Sync and Ultra Low Motion Blur technologies, and both sport 1,000:1 contrast ratios and 400 nits of brightness. Acer does claim these panels achieve 100% sRGB reproduction, although viewing angles of 170/170-degrees aren't great. Prices and release dates for the XB252Q and the XB272 are unknown at this stage, although with G-Sync and high refresh rates, they should slot in towards the top of the 1080p display market.